Disk Drive is portable software, it doesn't require installation. 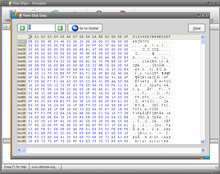 The main screen of Disk Wipe lists disks that are connected to a computer, either internal disk drives or external memory devices. Clicking on a disk device shows detailed information about it, file system in use, no. of sectors and other information's. 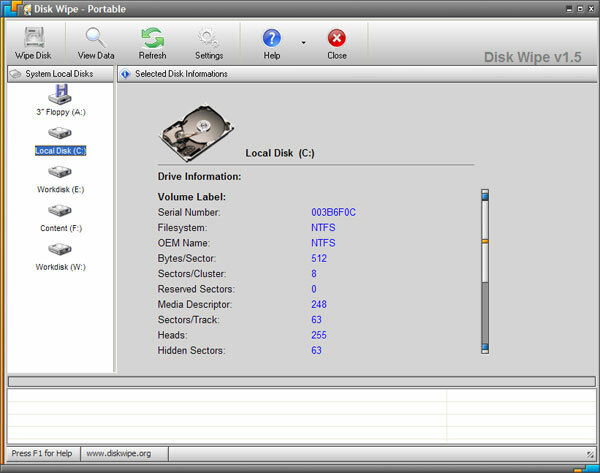 This screen shows how Disk Wipe recognizes removable disk and supplies information about it. Disk Wipe works with all kinds of attached removable memory devices, USB sticks, SD cards. It will work with many cameras or mp3 players that allows their memory to be used as a removable storage and which are formatted by one of supported file systems. 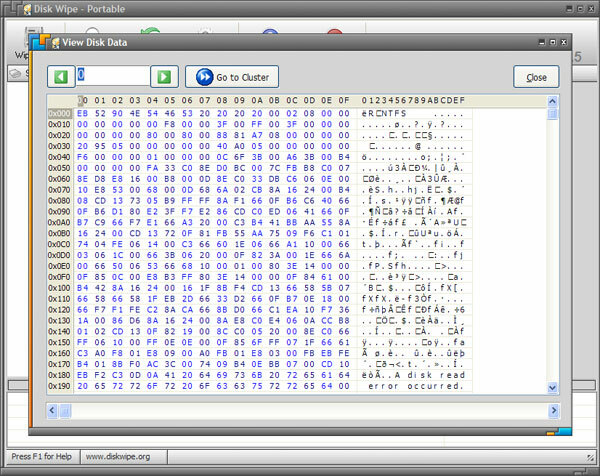 Pressing the "View Data" icon will bring a new windows which shows the content of the disk, raw binary data. Advanced knowledgeable users may find this option useful. The Settings panel allows you to optionally skip the confirmation steps prior to disk wiping. You can also name your wiped disk in here, under the "Volume Label" field. The default name is "Blank Disk" but you can change it to your liking. Setting the "Thread Priority" to one of values (from Idle to Highest) will set the level of processor power given to the running disk wiping process. Setting it to "Lowest" or "Lower" means that other running applications which are usually set to default will take more, or all processor power over the disk wiper, making it wiping the disk slower if you have other active applications doing some other job. But, setting Disk Wipe to the "Higher" or "Highest" could easily make your whole system slow and sluggish since processor power is primarily given to Disk Wipe, so it might be wise to leave it at default. When you press "Wipe Disk" icon you will be prompted to choose a File System. Windows XP and Windows Vista will typically use NTFS file system. Older versions of Windows may use Fat32 as well as some removable media. Check the main screen which reads the file system used for attached disks than use that information. "Perform Quick Format" option should be checked on for faster operation. If "Perform Quick Format" option is not checked Disk Wipe will perform a slower full format prior to wiping, which is not necessary because the disk will be wiped anyway after formatting so use the faster option which is "Quick Format"
This screen shows Disk Wipe in operation (wiping disk). 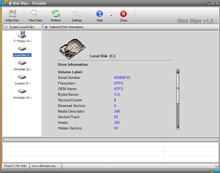 Disk is formatted, named "Blank Disk" by default and the line is showing progress of erasing, along with associated information for each step. Disk wiping can take a long time, depending on your hardware configuration and method of wiping chosen. You can download Disk Wipe here.